LOS ANGELES (CelebrityAccess Media Wire) — The Electric Daisy Carnival may soon be a Live Nation production. Insomniac Events, the producer of Electric Daisy has reportedly been in talks with Live Nation regarding the sale of the dance music festival, according to the Los Angeles Times. 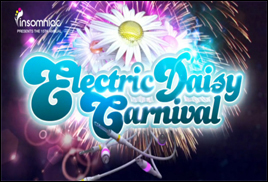 With dance music growing in popularity, the 2012 Electric Daisy rave in Las Vegas hosted more than 300,000 people, up from about 200,000 people in 2010. The Los Angeles Times reported that Live Nation would purchase a roughly 50% interest in Insomniac. The Wall Street Journal, which first reported news of the pending sale, said Live Nation is paying $50 million for the stake in Insomniac. Despite these reported talks, there is chatter that Insomniac is also considering "other interested parties," a company spokeswoman said in a statement. SFX Entertainment may be another potential bidder for Insomniac. Despite the excitement of taking on this growing festival, whoever wins a bid for Insomniac may also inherit its issues. Plagued by reported drug use and overdoses, the new producer will have a demanding task at hand for damage control at future events.